Like many homeless veterans, James Williams had hit what he called a “bottomless pit.” He had seen it all. Aside from homelessness, his many medical maladies were catching up with him as he got older, including diabetes, early stages of emphysema, and a heart condition. James, 60, says he got involved with drugs from a young age, but eventually got married and had five children. The marriage dissolved with the same kind of behaviors and attitudes that come with drug addiction, and he found himself in a downward spiral. While participating in an outreach program at St. Peter’s Hospital in Albany, he met a representative from Soldier On, where he now resides. Being at Soldier On, he says, allowed him to focus on his addiction and, importantly, his health. “If I had continued the way I was, I would have ended up dying in prison,” James says. “I didn’t want to do that to my grandchildren because I wanted to be in their lives.” To that end, James was one of three veterans in Soldier On’s Pittsfield facility to enroll in the Berkshire Health Systems Canyon Ranch Institute’s Life Enhancement Program. Life Enhancement is an intense weekly program for committed individuals who want to address their chronic diseases by changing their life by focusing on four dimensions of health: physical, mental, emotional and spiritual. By taking an active part in his recovery, James said he has found a better way to deal with his illnesses through the program by diet, exercise, nutrition, and gaining a deeper understanding of his conditions. James was joined in the Life Enhancement Program by fellow veterans Kevin Counter and Chip Mantz. Kevin, 48, who served in the Army from 1990-98, was being kept back from serving overseas because of his Crohn’s Disease, which was diagnosed in 1991. When his disease worsened, he was eventually given a medical retirement. Sick with Crohn’s and waiting for his VA claim to come through, Kevin found himself fighting alcohol and drug addiction because of his tendency at the time to self-medicate. He also lost his job because he was often sick and he eventually became homeless. The VA Medical Center in Leeds, where Kevin was receiving his primary care, steered him to Soldier On. Kevin was prompted to participate in the Life Enhancement Program to learn more about his disease and manage it better. What he has learned, he says, is that his symptoms are definitely associated with nutrition and exercise, which he has improved upon, while also finding ways to reduce stress, which is another contributing factor with Crohn’s. Taking active role through the Life Enhancement Program has helped him to better deal with the disease and relieve his symptoms, he says. Chip Mantz, who served in the U.S. Navy nine years, has 23 years of sobriety to his credit. After losing his job and his apartment, Chip became homelesss in his home town of Allentown, PA.
Chip went to the VA for homeless services and they gave him a choice to go to either San Diego or to Massachusetts to Soldier On for placement. The head of case management at Soldier On, John Crane, urged Chip to enroll in the Life Enhancement Program to deal with his weight and other issues. He has had perfect attendance since. The Berkshire Health System’s Canyon Ranch Institute offers its programming typically in low-income or medically underserved communities, and helps individuals to change their life. James Williams, Kevin Counter and Chip Mantz can attest to that. Festival season means a lot more than visual art on the stage and screen. Street style at festivals gets nearly as much hype as the artists themselves, and we’d be remiss if we didn’t take the opportunity to scope out the coolest bits of inspiration at Lollapalooza 2014. In the Arists Village of Lolla, bands, solo artists and DJs relax before and after their time on stage. This year, Andis and Barber Authority saw an opportunity to make artists’ downtime relaxing and productive by hosting a barbering tent. Barber Authority is a group of more than 50 barbers led by Master Barber Steve Vilot of Sim’s Salon and Barber Shop in Great Barrington, MA. 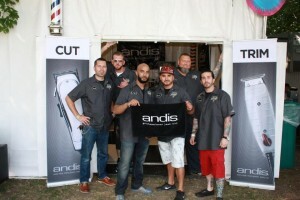 The group goes to various events around the country—music and film festivals, X games, and educational events to name a few—to bestow the gift of barbering on artists, athletes and attendees. Vilot pointed out that events like this are great opportunities for his team as well as for the artists; many of them simply lack the time on tours to keep up with maintainingtheir hair.